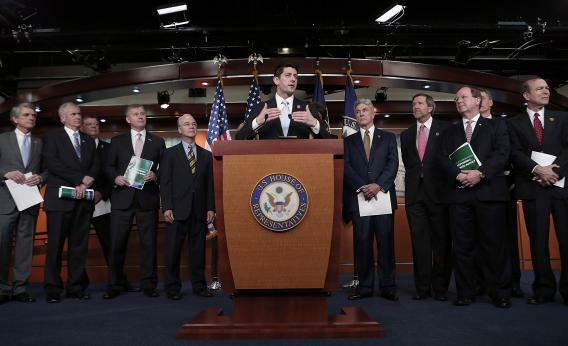 Paul Ryan budget: Keep fiscal cliff tax rates but repeal Obamacare. Rep. Paul Ryan (R-WI) presents his budget plan during a press conference at the U.S. Capitol on March 12, 2013 in Washington, DC. My colleague Matthew Yglesias is tearing through the House GOP budget proposal like a termite through balsa wood. I’m writing about the proposal in full today, a bit later, but Ryan’s well-built press conference—flanked by the Republican members of his committee and by screens playing Powerpoint presentations—was a controlled series of contradictions. The first question from the press: Why did Ryan assume the tax revenues from the fiscal cliff deal? He’d voted for that deal, but he wanted lower rates. “We’re not going to refight the past,” said Ryan, “because we know that that’s behind us.” The “anti-growth tax code” would be replaced, in a manner to be dealt with by the Ways and Means Committee. Second question: Why did the budget assume the repeal of the Affordable Care Act, given that this can’t happen while Barack Obama is president? So they won’t refight the past. They’ll stop the past from becoming the future.